I’ve been looking forward to writing this expert secrets review for a few reasons. I’ll be honest, i didn’t really use to like reading! But i knew if i wanted to become more knowledgeable, i’d have to learn to love it. Expert secrets changed my perspective on reading, after finishing this book i quickly realized that i actually loved reading, i just needed to be reading something i was passionate about. I now read at least a couple of books a month and this is one of my favorites so far, if you are interested in building online businesses you will love expert secrets. Today i’m going to go through some of my favorite parts of the book, it’s another masterpiece from Russell Brunson, the digital marketing guru and creator of clickfunnels. At the end of the article i’ll provide you with a link so that you can get yourself a free copy of expert secrets, all you’ll have to do is pay the shipping cost. Before writing this book, Russell wrote another called dot com secrets, it’s another one of my recommended reads for all you entrepreneurs out there. What is Expert Secrets About? 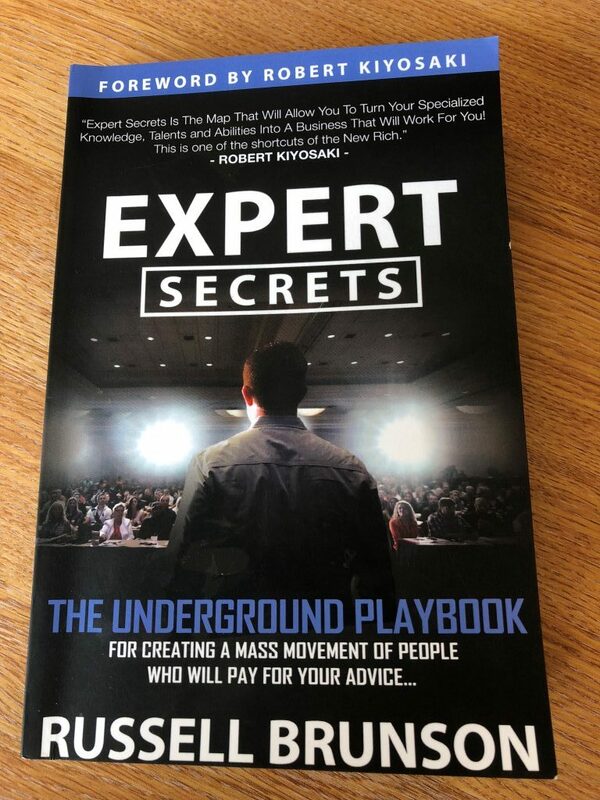 In short, this book will teach you how you can become an expert in your field, it will then show you how you can build a mass following of people, willing to pay for your advice. If you have an interest in marketing, you’ll want to read expert secrets. This book runs through a list of marketing secrets, a lot of which apply to both online and offline businesses. I first heard about the book on a digital marketing forum, it was one of the most recommended reads of 2018. This book is going to teach you how you can build a cult like following of people, all you need to do is follow the advice set out in the book. The model Russell teaches is a one size fits all approach, whatever your niche is you can apply this theory. If you are worried about the word “expert” don’t be, to build a following of people you don’t need to have qualifications, all you need is a passion for your subject, you need to be two steps ahead of your following. The author of the book (Russell Brunson) has built a following of over 1,000,000 entrepreneurs and that figure continues to grow everyday. What makes Russell such an expert? Well in short, his obsession with how people think and behave, he has used his marketing abilities to help other entrepreneurs make millions online. Russell has an exclusive club for entrepreneurs that have made $1,000,000 with click funnels, the club is called the 2 comma club and it already has over 200 members. So yer, i think it’s worth listening to his advice. Anyway, let’s dive into this expert secrets review. This is secret number #2 in expert secrets, it provided a real light bulb moment for me. If you want to build a loyal army of followers, you will need to create a “future-based cause”, let me explain this in more detail. Think of it like this, every successful social, political or religious movement has a charismatic leader in place. It’s their job to paint a perfect picture of the future. If you want to be a leader or an expert you are going to need to help bring your followers to higher ground. “Where there is no vision, the people will perish”. “If you have ever watched the elections over the years you’ll notice that the candidates that win, do so because of their ability to create a vision of the future that people want the most now. In 92, George Bush had ~ A proud tradition. Whilst Bill Clinton’s was ~ It’s time to change America. In 2008, John McCain’s was ~ Country First, whilst Barack Obama’s motto was ~ Change we need. 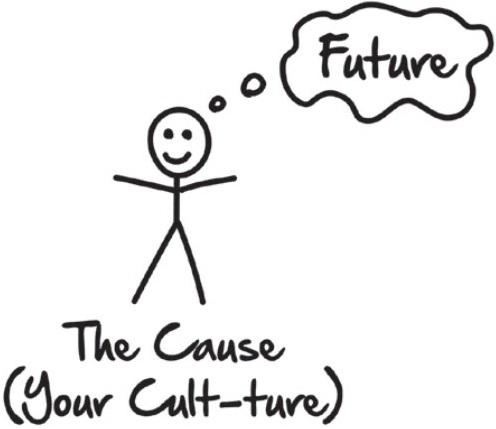 Notice how the winners cast a compelling vision of the future, where as the losers are more focused on the present? You cannot argue with the above, but how does this apply to you and your business? Well, if you want to build a following of people, you will need to build your own “cult-ture”, you need to create a vision to unite your followers, show them the change you can help them to achieve. If you want to help your followers lose weight, you can create the vision of what their life might be like when they reach this goal. What do your followers really want? What are you going to help them achieve? Answer these questions and you can sell your following the answers with helpful informational products. This is such a powerful concept, some of the most powerful people on the planet understand this concept, can you imagine what this understanding can do for you and your business? Let’s jump into the next section of this expert secrets review. I have no doubt that reading expert secrets will change your perspective on business, but if you learn from the book and put these lessons into action you can change your life. Secret #6 is based around story telling, this is one of the most important weapons you can carry. If you are selling a product or a service, you and your customer need to be on the same page. To be fair it’s the same in your personal life, if you’ve experienced the following you’ll know what i mean. Have you ever tried to explain a really funny story to a friend and they just don’t seem to get it? They understood but they weren’t crying with laughter like you were. You try to explain the story in a different way but they still don’t get it, it ends up turning into one of those, Oh you had to be there moments! I hate those moments! It was really funny, why don’t you they get it! Well it’s quite simple, that person didn’t experience what you did within that moment. You repeating what you experienced meant nothing to the person because they hadn’t personally experienced it. If you are struggling to sell somebody into a new opportunity, you might be be suffering from the same problem. You might know that it’s a golden opportunity, but telling the person about how great it is, is not good enough, you have to help them feel what you feel. You cannot force somebody to think a certain way, but you can plant the idea into their mind with a story, then it’s up to them to come up with the answer. 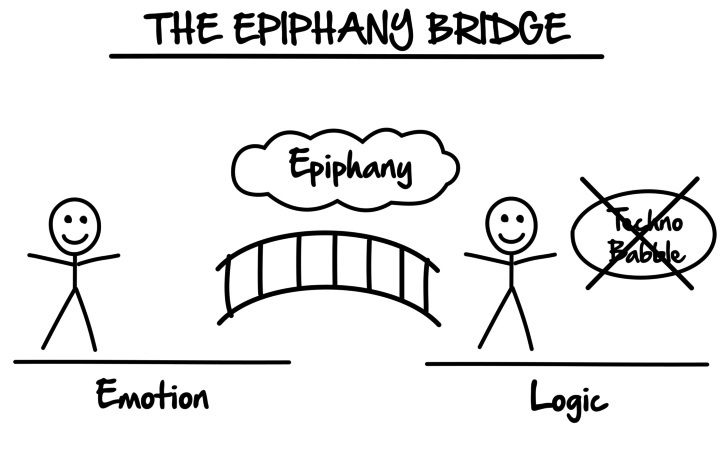 In simple terms “The Epiphany Bridge” is simply a story that takes people through the same emotional experience that got you excited in the first place. Let’s take selling online for example. When i started selling online a few years ago, i remember how it felt when i made that first sale, i thought “Wow, this is awesome”, that was my epiphany moment. Again, when i made my first commission with affiliate marketing, i had that same feeling again. The first time you discovered your “Expert” topic, something happened to you, you had an epiphany. If you can help your followers feel this emotion, they will buy into you and your cause, people don’t buy logically, their purchasing is based on emotions. Let’s say you buy a flashy watch, you have invested into the feeling you get when you wear it (this is the emotion), but if you want to logically justify it to yourself or your other half, you will explain how you got a great deal or how it will only increase in value. You see, logic is the justification for the emotional attachment you’ve made to the object. Do you see how emotions dictate EVERYTHING? If you want to get better at selling, you have to improve your story telling abilities and you can do this by adding in feeling and emotion. In expert secrets, Russell explains how one of my favorite films (X-Men: First Class), uses the power of emotion, here’s another extract from the book. “In this movie, we are taken back through the X-Men’s past and given a glimpse of what it was like for them growing up and discovering their powers. There was a scene where young Magneto was taken to a Nazi concentration camp, and as they pulled him and his family into the gates, they noticed the metal fences around their compound started to move as he started to resist them. They wanted to see what his powers were, so they brought him into a small room with a Nazi leader who wanted a demonstration of his powers. They also brought Magnetos mother into the room, so they could use her as leverage to get him to do what they wanted. The leader points a gun at Magnetos mother and has him try to move a metal coin on the desk. He nervously tries to move the coin, but isn’t able, so the leader pulls the trigger and kills his mother. And then you see a scene so powerful that, without a single word being said, you actually feel the pain that Magneto is going through. As you watch the film, you can see all of this happen without any words, because we can see his face, we can experience the room, through all of this we somehow manage to feel (in some way) Magneto’s pain and suffering. This is the power of film! Now the book isn’t saying you need to go out and produce films to sell your products. The book is highlighting the importance in learning how to tell stories in a way that provokes the right emotions. Let’s move onto the next section of this expert secrets review. Secret #7 is my personal favorite, it revolves around the art of story telling. This section of the book discusses the important of story structure, “The Hero’s Two Journeys” concept was inspired by an audiobook authored by Michael Hauge and Chirstopher Vogler. Michael is one of the most respected script consultants in Hollywood, he’s been doing it for more than 30 years. Michael is an expert in structuring stories for maximum emotional impact, if you are in the marketing space, you’ll know that nothing sells better than emotion. After listening to the audio book (The Hero’s 2 Journeys), Russell was so impressed that he decided to hire Michael to speak at one of his events, he learnt alot from this story telling genius. Simplicity is key, great stories are simple! You should be able to tell the same story in 60 seconds or 60 minutes, both of which can have the same desired effect. Every good story is built on the same three fundamental elements, Character, Desire and Conflict, this of course is also know as the plot. “Once upon a time, there was a girl named Red Riding Hood” She wanted to take a basket of cookies to her grandma, who lived in the woods. What she didn’t know was that the big, bad wolf was waiting to gobble her up. These are the basic elements of every movie, book, play, TV show etc – any type of story. After showing me this, Michael explained ~ Every good story is about a captivating character who is pursuing some compelling desire and who faces seemingly insurmountable obstacles to achieving it. Think about your favorite movie, what’s the plot behind the story? My personal favorite is “The Pursuit Of Happiness”, it’s a superb film, with a great story. Do you see the emerging pattern? A great film will make you feel real emotions, and that’s how it’s done. You can use this exact same technique to win over your audience, think back to secret #6 (The Epiphany Bridge) you need to learn how to tell your customer a story, then you can trigger the right emotions. Think about your business or business idea, you will of had a moment that got you really excited, abit like an epiphany. Well, we want your potential customer to feel what you felt, then they can get excited about the opportunity you are offering to them. To create your story you are going to need to work out the three basic elements, character, desire and the conflict. Take a moment to think about your story, you are the character, so that step is easy but what got you started? What are you looking to achieve? Figure out the conflict you experienced along the way and there you have it, you’ve got a plot. When Russell Brunson created clickfunnels he took the time to figure out his story, this made it easy to sell to his following. Here are the three basic elements and here is how he tells his story. This story has a one word fairytale ending; clickfunnels. 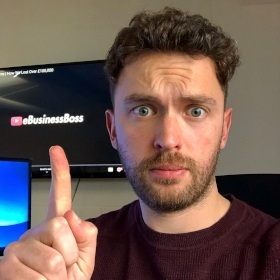 By going through this conflict Russell learnt about building out sales funnels, by offering upsells and downsells he made his customers profitable again, this meant that googles increased ad costs were no longer a problem. This story can be told very quickly and this makes for a great advert. Story telling is an important skill for any business, within this section of the book Russell shows you how to build your own story and this was my favorite takeaway from the book. Anyway, let’s move onto the concluding section of this expert secret review. So, Is expert secrets worth buying? Yes it is, but don’t pay full price! You can get yourself a free copy by using one of the links i have provided, well the book is free all you have to do is cover the shipping! It really is a great read, I’ve revealed my favorite three secrets but there is a lot more inside. This book is for people interested in building an audience, whether you have an existing business or just a business idea, i’d recommend reading this before you do anything else. So there is my expert secrets review, i hope you’ve found this article useful! I didn’t want to reveal too much and ruin the book, if you want to learn more, you’ll need to grab a copy yourself. Who Is The Click Funnel Founder?